thanks for the feedback. Because the engine was cold i the values are OK – engine should run with this values on all 6 cylinders. Is the exhaust system on the left free floating. Means maybe you have a clogged / blocked catalysator and the exhaust gas can't escape. Same for the intake. Please check if everything is free and nothing is in there - no air, no explosion. Check if all sparks ignite. If you have a tool to check if you have ignition on sparks when motor is running, please check that. In german it's called ignition lamp - don't know wthe correct english term is. It visualizes spark ignition. Hope that helps or maybe get's you another idea what you still can test. PS: it's always a bit tricky for me to describe these things in english, because i don't always know the correct technical terms. If something is misleading, please ask. Last edited by Smallblock454; 04-20-2016 at 10:00 AM. I know it's 5 pages long and a lot to read, but a lot of your questions have already been answered by the OP. It is too much to read. So here's a summary. Bought a non-running 1998 Base Boxster with 96000 miles. stored in a barn in the desert south of Sierra Vista, AZ about 10 miles from Mexico. I could find no one in Phoenix or Tucson to go there and do a PPI. So at this point, I should have fuel, air, and spark. I have not tested the O2 sensors. No CEL is being thrown. Durametric shows no codes being thrown. I also have not cleaned the IACV or the throttle body. I think that's about it. At this point, I'll install the new spark plugs I have and give it a go. Tom; I think your compression numbers are way low. Even cold you should see 145 psi or more. Hot compression should be 180+ psi. Since plugs are out a simple test might be to get a helper and some chopsticks then with chopstick on top of piston mark chopstick at TDC then roll engine by hand and get BDC measurement all cylinders. Then compare to each cylinder. What is the compression specification for the 2.5 liter engine? I've searched and searched. I see a post by Jake Raby that says it should be over 200. I see others by JFP that says around 145 and that the results should be within 15 percent of each other. 911monty. I like your suggestion. It's a test for a bent rod. I will have to find a patient helper. My wife doesn't mind cranking it over, but to get her to actually turn an engine by hand is a definite NO. Last edited by tada; 04-20-2016 at 11:38 AM. Lots of factors determine compression condition of motor of course but temperature, density, humidity and altitude all contribute. I think the numbers I gave are conservative for Arizona. Like I said with a failed AOS bent rods are a possibility. Then piston to dome height increases and compression decreases. Not trying to be pessimistic, just think I would want to eliminate this potential. Good Luck. I believe 200+ is for the 3.2. The 2.5 should see 140's cold. Your #'s are a bit low, but not too bad for a 2.5 with higher miles. What's important is the variation from one cylinder to the next (you want them within about 10% of each other). I think your compression #'s look fine. Leak down? Compression ratio on a 2.5 is 11.1. AT sea level this would be approx. 165 psi. As sleeves, rings and valve seals wear, that number drops. A leak down test would probably support this. Yes. But what is significant in this case is that the really low numbers are all on one bank which tends to be mechanical. Still the question if the exhaust system is free - no clogged cats. Sorry, but this is a very important questions and i'm sorry if i overread that. Don't wan't to bore anybody. Also the 2.5 has a variable valve system. So compression rate can vary. Even if they are lower / low on the left bank it should run on all cylinders. But if you listen to tada's video it only runs on 3 cylinders. And by the way Markus, your English is excellent. Far better than my German could ever be. Tom; You just need to find TDC #1 (timing mark) find piston top with chopstick through spark plug hole and mark. Turn crank 180 deg (BDC) and mark chopstick again. Then place chopstick into each cylinder and rotate making sure all pistons reach the same marks. It's not precision, just looking for major difference. Have you checked the cam timing? My engine sounded just like your video when my bank 2 timing was off. I had similar symptoms but not exactly. I got engine check light and it started dying whilst I was sat in traffic. I could rev it but as soon as I let off the gas it would either die or seems like its about to die. Problem turned out to be one of the solenoids, and fyi, it is quite expensive. I would try to check them out, although I'm not quite sure how. Timing definitely occurred to me. I thought maybe the camshaft position indicator could be bad. But to check the cam timing, don't I need to get it running and check it with the Durametric? Just read an article on cam timing. Can this be done without dropping the engine? I can tell you from past experience that it is possible to check the cam timing without dropping the engine. Checking the timing only requires being able to rotate the engine to TDC and removing the 6 green plugs. I used the camera on my phone to take pictures of the cam notches so it was easier to see. 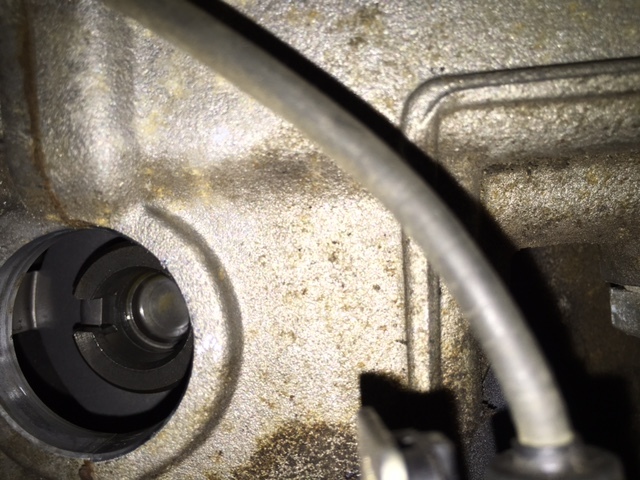 Yes -pin TDC @ the crank pulley, remove blue camshaft plug (you will need new one) on offending cylinders and check slots on end of camshaft lines up with marks as per article. Before I got the chopsticks out and started measuring cylinder stroke to check for a bent rod, I popped the camshaft plug on bank 2 and looked at the timing. A couple of pics are shown below of the crank at TDC and the position of the camshaft. The phone camera was as level and as close as I could get. Imagine taking these with a 35mm camera? So, what do you all think? Pretty close. Last edited by tada; 04-21-2016 at 06:00 PM.